We should all recognize this creature as the animal with the highest metabolism of any other creature on earth! While sipping nectar from a flower the hummingbirds wings beat 50 times per second and are capable of beating up to 200 times a second to escape a predator. They can fly in all directions: forward, backward, and sideways. They can also stop in mid-air; their wings beating and rotating like little helicopters. Where does the fuel come from to keep this little guy going? The nectar provides the fuel; every one of the 1000 flowers that this little guy visits in a day is a fuel stop. What always amazes me is that no one ever wonders, where does the protein come from to repair and grow his little body? NO, sugar (nectar) is not a source of protein. Ever notice that the flowers that this little guy sips the nectar from have no aphids? or caterpillars? or ants? or gnats? or mosquitoes? Guess why. He ate them! 20% of their daily diet is insects, but when it’s time for migration or nesting time comes along our little guy turns into quite the carnivore consuming almost half his weight in insects. Nature helps by providing the ultimate “convenience store and fast food shop in one” for the hummingbird; the local spider’s web! It is there, caught in the web, insects too small for the spider to pay attention to, that our little guy can pick and choose until the owner of the web shows up. To the hummingbird the spider is a big ball of food with eight legs! Then also the solution to the humming-birds “home” problem is solved. What is the problem? How to get a nest to stay stuck to a branch and hold together when it’s just a little bigger than a half dollar. The solution is the spider’s silk from the spider’s web! It’s the spider’s web that provides the means to hold the little nest together and keep it held to the tree. What happens if the Hummingbird gets caught in the web? Well, if the hummingbird didn’t eat the spider before being caught in the web the hummingbird will be eaten by the spider. 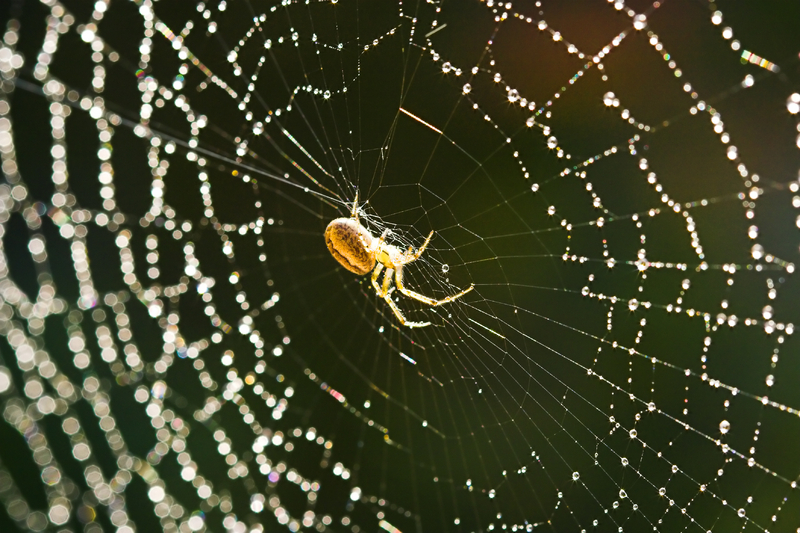 If the spider has been eaten and the hummingbird gets caught in the web he will die from exhaustion or starvation. 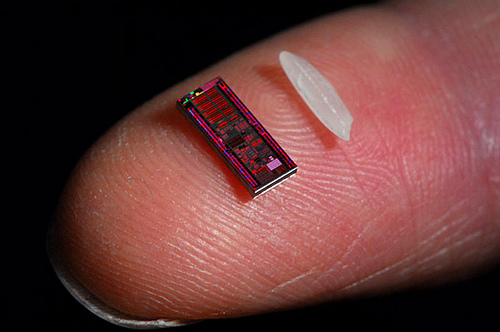 Processor with a grain of rice ! We should all recognize at least two of the objects in this picture, right? This entry was posted on Tuesday, March 23rd, 2010 at 2:04 pm and is filed under Biology, computer science, Hardware, Internet, Science. You can follow any responses to this entry through the RSS 2.0 feed. You can leave a response, or trackback from your own site. 2 Responses to Two Tiny! Valuable info. Fortunate me I discovered your web site accidentally, and I am surprised why this accident didn’t took place in advance! I bookmarked it.